Posted on August 22, 2016 at 1:52 pm. Over the weekend, Hong Kong billionaire Tony Fung announced he is pulling out of his six-year plan to build the Aquis Casino in Cairns, an integrated resort that was set to cost upward of $8.15 billion. Mr Fung will continue with his plans to develop the proposed $2 billion luxury hotel, villas and high rise apartments, but will no longer continue with the casino project. Mr Fung cited a downward spiral in the global casino industry for his decision. “The casino industry is not the same as it was 26 months ago,” said Fung, who recently pumped $200 million into the Canberra Casino and a horse breeding stud in Queensland said his main interests now lie in real estate. Mr Fung’s decision to withdrawal from the casino development now means one of two regional casino licenses are back up for the taking. Crown Resorts, owned by James Packer, is eager to re-enter the Queensland market after losing against rival Star Entertainment for the rights to the $3 billion Queens Wharf precinct in Brisbane. Crown is now in negotiations with ASF Consortium, which holds preferred status for a second casino license on the Gold Coast. ASF plans to build a $2 billion integrated resort and casino in the land between Sea World and the Gold Coast Fishermen’s Co-operative. Sydney property developer and CEO of Tower Holdings, Terry Agnew, is also a contender for the second casino license for his proposed boutique resort at Great Keppel Island. It’s not yet confirmed whether the government will seek to find a new bidder to take over the Cairns casino license. Queensland Premiere Annastacia Palaszczuk is expected to announce her decision soon. The Aquis Casino was originally part of a plan to grow the international tourism economy by $9 billion by 2020, which means if any new integrated resort developments get the green light they will need to begin construction within 18 months of approval. 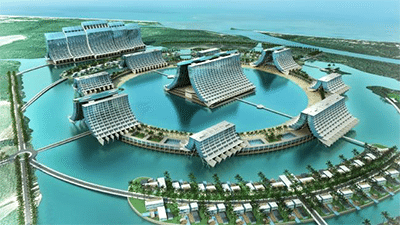 Mr Fung’s luxury hotel will be built upon a 320ha beachfront site adjacent the Great Barrier Reef.